LOCATION.--Lat 40`04'45", long 75`27'40", Chester County, Hydrologic Unit 02040203, on right bank 100 ft upstream from Pennsylvania turnpike bridge, 0.9 mi downstream from Little Valley Creek, and near Valley Forge. PERIOD OF RECORD.--October 1982 to current year. GAGE.--Water-stage recorder, water-quality monitor and Pluvio precipitation gage. Satellite telemetry at station. 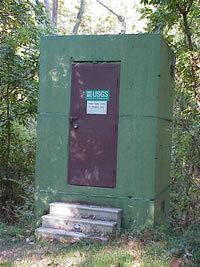 Datum of gage is 108.62 ft above National Geodetic Vertical Datum of 1929. COOPERATION.--Funding for the operation of this station provided by Chester County Water Resources Authority, the U.S. National Park Service, and the U.S. Geological Survey. REMARKS.--The equipment used to measure precipitation amounts is not heated. Values displayed during periods of freezing temperatures will be inaccurate. Intermittent pumpage from quarry upstream.